The ocean is integral to our society. According to data from the 2010 census, more than half of all Americans now live in coastal watershed counties, which comprise less than 20 percent of U.S. land (excluding Alaska) and have an average population density more than five times higher than inland regions. Anyone who has ever seen the words “waterfront property” on a real estate advertisement knows that demand for such locales far outstrips supply. 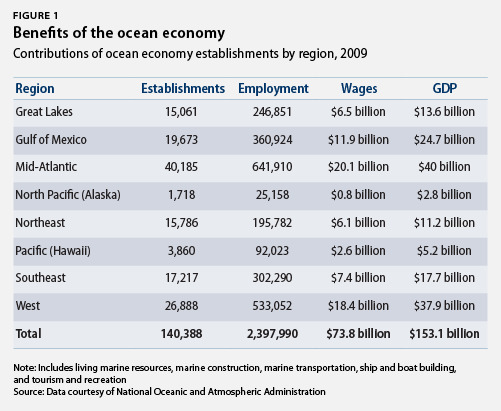 Groups such as the Center for the Blue Economy, which now encompasses the National Ocean Economics Program, are increasingly striving to develop models to evaluate the overall fiscal benefits of our oceans, pulling together some heretofore unknown metrics of the overall effect coastal counties and states have on America’s economic health. To date, their topline findings have been significant: In 2010 shore-adjacent counties, those touched or encompassed by a state’s defined coastal zone, contributed more than $6 trillion to our gross domestic product and accounted for 44 million jobs. Despite these efforts, finer-scale economic data about our oceans and coasts remain elusive. We can quantify employment, salaries, and expenditures in some cases—offshore energy workers, fishermen, and lifeguards at public beaches, for example. But others are more difficult to nail down. How do we classify a desk clerk at a hotel 10 miles from the shore? The owner of a convenience store that sells sunscreen and beach chairs alongside eggs and milk? How much a bird watcher spends to kayak through a marsh? And how can we put a price on the resources themselves? Wetlands filter pollution, protect upland property from storm surges, and serve as nurseries for fish and other marine species. So how much is an acre of marshland really worth? This brief launches the Blue Economy project at the Center for American Progress, laying out the groundwork for what will be an ongoing effort to promote industries that recognize and augment the clean and healthy ocean, coastal, and Great Lakes ecosystems that drive our financial, biological, cultural, and spiritual well-being. These components are certainly not the only drivers of the ocean economy, nor are they necessarily the largest contributors or the ones for which we have the best supporting data. But they constitute what we consider the foundation for healthy and productive oceans, coasts, and Great Lakes. This initial list has some notable omissions. This report, for example, will not wrestle the gorilla of offshore oil and gas development. While this industry has massive and undeniable economic value, risks of environmental destruction that many consider unacceptable counterbalance these contributions. The BP Deepwater Horizon catastrophe has largely faded from public consciousness more than two years after it occurred. In the interim, Congress has failed to take any action to make offshore drilling safer or increase the liability for the companies that threaten marine resources. Meanwhile, we seem to be marching incessantly toward even riskier development of offshore resources in the remote and pristine Arctic Ocean. We also will not delve into maritime transportation, another of the largest economic activities in our oceans. The global shipping industry carries 90 percent of world trade, shapes all commerce, and underpins the global economy. Yet because this report focuses on the nexus of the environment and economy, we do not have space to address shipping. Ships, after all, don’t care whether the water that floats them is dirty or clean, though the industry can be “greened” at relatively low cost and with great benefit to coastal ecosystems. Instead, we focus on industries that depend upon and can coexist with and benefit from healthy oceans yet still lack full definition of their tremendous potential economic benefits—either because of difficulty quantifying them or because the industries are emerging or in flux, thus requiring additional resources and attention before we can truly evaluate their benefits. These industries have the added benefit of fueling our passion, feeding our souls, and protecting the resources that make our oceans and coasts so fundamental to the human experience. Is it possible to put a price tag on that? Perhaps not. But our goal is to better understand the true value of America’s Blue Economy. The summaries below provide a blueprint for future CAP work defining the contributions these sustainable ocean sectors make to our economic well-being. 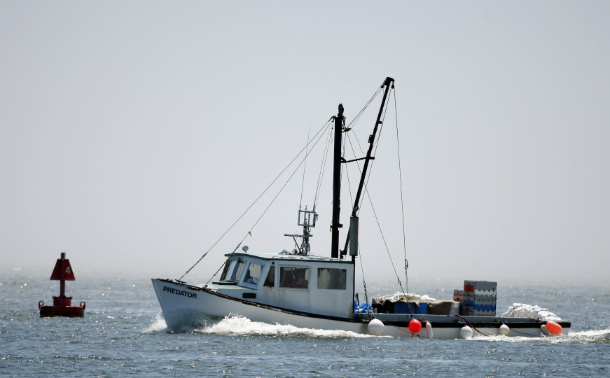 Fishing is perhaps the first vocation that comes to mind when considering ocean and coastal economic activity. Fish brought the earliest European settlers to the Americas—before gold or trade routes or colonization became the targets of future exploration. Today, most Americans still connect to the ocean through fish, whether they are among the nation’s 12 million recreational anglers or simply enjoy an occasional Filet-O-Fish sandwich. While much of today’s fishing news is doom and gloom—preponderance of overfishing, reports that oceans will be nothing but jellyfish by midcentury, and scary predictions of species collapse for everything from the majestic bluefin tuna to the lowly menhaden—there is actually ample reason for optimism. Sustainability is taking hold with consumers, regulators, and industry members alike. We have ended deliberate overfishing in the United States, and the NOAA’s most recent “Status of Stocks” report to Congress showed a record number of domestic fish populations rebuilt to sustainable levels. In addition, consumer-driven initiatives have led many major retailers to change their buying habits and exclude unsustainably-caught seafood from their shelves. Establishing long-term, sustainable fisheries will be tremendously beneficial to both our environment and our economy. In testimony before the Senate Committee on Commerce, Science, and Transportation in 2011, NOAA Administrator Jane Lubchenco estimated that rebuilding all U.S. fish populations to sustainable levels could generate “an additional $31 billion in sales impacts, support an additional 500,000 jobs and increase the revenue fishermen receive at the dock by $2.2 billion … more than a 50 percent increase from the current annual dockside revenues” (emphasis in original). Meanwhile, U.S. seafood consumption has dipped slightly, down from 16 pounds per person in 2008 to 15.8 pounds in 2009, while global seafood consumption has doubled in the last 40 years. At the same time, the percentage of fish we import has skyrocketed. Today, roughly 85 percent of the fish we eat is caught, grown, or processed in other countries. The U.S. trade deficit in seafood products is a staggering $9 billion, ranking second among natural resources only to crude oil. This is bad news not just for our economy but for the environment as well. The United States is home to some of the most sustainably managed fisheries on the planet. Each fish we buy from a country with less stringent standards not only takes a bite out of American fishermen’s bottom lines, but also contributes to the decline of global fisheries. Aquaculture, or fish farming, is increasingly playing a greater role in putting fish on our plates. Fully half the fish imported in 2010 was a farmed product. Given the escalating dietary needs of a booming world population, aquaculture will have to be a part of the future of fish. Yet aquaculture, which can be carried out either in the ocean or at land-based fresh or salt water facilities, comes with its own set of environmental concerns, including high concentrations of waste, the need to catch wild fish to feed farmed fish, and potential for corruption of wild populations’ gene pools. But in this sector, too, the United States has far more stringent environmental and human health regulations than virtually any of our trade partners. Given the clear differences between domestic and imported seafood in terms of sustainability, product quality, and local sourcing, consumer education and market forces can provide a springboard for increasing the value of U.S.-caught fish. This will return more dollars to our fishermen and allow them to make a living without increasing their harvest and compromising the future availability of a finite yet renewable natural resource. Rebuilt fisheries will pay dividends for recreational fishermen and local economies as well. Anglers spent $18 billion on equipment and for-hire vessels in 2006 alone, according to the NOAA’s most recent figures. These contributions rippled through coastal economies, ultimately contributing $49 billion and creating nearly 400,000 jobs. 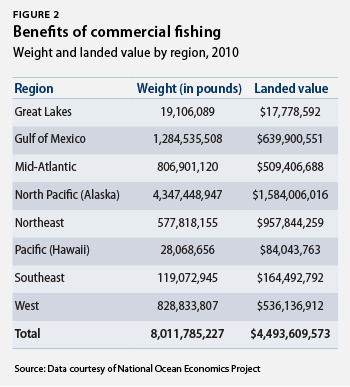 Further, these figures don’t account for revenues earned by support industries that provide hotel rooms, meals, travel, and other services of which recreational fishermen avail themselves in their quest to land the big one. Domestic regulators—with help from a legal mandate enacted by Congress requiring every domestic fishery to operate under a science-based, annual catch limit—have put our fishing industry on track to rebuild fish stocks and increase the employment and profitability of the recreational and commercial U.S. fishing and aquaculture industries. But to make this a reality, all fishery stakeholders—fishermen, regulators, consumers, environmental groups, and politicians—must understand that while it may not be perfect, sound science must be the foundation of fisheries management. Counting fish is astoundingly difficult. They’re largely invisible, they’re constantly moving, and they eat each other. Even our best scientific estimates are inherently inaccurate. Yet both common sense and the law dictate that we must use the best data available to set catch limits that will have the highest probability of achieving the goal of rebuilt, sustainable fisheries as quickly as possible. This will always be a balancing act, but if we can agree on the underlying concept, we’ll be well on the road to finding a solution that works for the fishermen of today and the future. Visiting the beach is the greatest connection to our oceans for many Americans, and coastal tourism and recreation sustain our coastal economies. Traveling to the shores along our coasts and Great Lakes and snorkeling, boating, and surfing are activities that directly contribute to local economies. 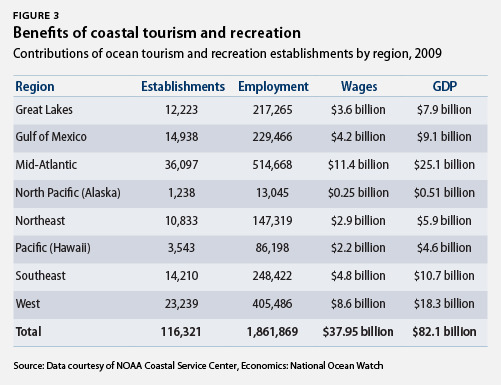 According to the Joint Ocean Commission report “America’s Ocean Future,” in 2007 the leisure and hospitality industry in U.S. coastal states supported almost 11 million jobs and more than $214 billion in wages. Florida exemplifies the great economic value of nonextractive ocean and coastal activities. Florida’s tourism, fish and wildlife, ports, and defense-related industries generate more than $175 billion in economic benefits and more than 2.2 million jobs annually. Tourism is Florida’s leading ocean industry, employing nearly 300,000 people, generating $5.9 billion in wages, and adding $13.3 billion annually to its gross domestic product. The oceans and Great Lakes are not an everlasting source of recreation and GDP, however. These activities and industries all require healthy oceans and coasts to prosper. Who wants to relax on a contaminated beach or surf through an oil slick? This is why Floridians have long been wary of offshore drilling and its potential to kill the tourism industry—the goose that lays the state’s golden eggs. Even in the face of mounting pressure to open more areas to drilling, Florida has maintained a two-decade-old ban on drilling in state waters. Oil spills and other disasters are inevitable consequences of offshore drilling, and the Deepwater Horizon disaster took a huge toll on Florida’s economy. In the immediate wake of the spill, for example, “many Panhandle hotels and restaurants reported seeing sales down by 50 percent in the peak summer months,” and in Franklin County, located in the northwestern panhandle, tourism in July 2010 declined by 25 percent from the previous year, according to the county’s tourism bureau. The Joint Ocean Commission’s report also found that as of 2007, more than 85 percent of California’s GDP and nearly 12 million jobs derived from economic activity in the state’s coastal estuarine areas. California’s beaches are also vital assets to the state’s economy, with total value estimated between $1.5 billion and $3 billion per year. Losing these valuable resources would devastate the California economy. During the summers of 1999 and 2000, stretches of Huntington Beach’s beaches were repeatedly closed due to high levels of bacteria in the surf. At the time, more than 5 million people visited the beaches each year, helping to support a regional tourism industry of $80 million. A 2006 analysis supported by NOAA and conducted by researchers from the University of California estimated that each day of closure resulted in losses of $36,939 in output, $21,361 in value added, and $13,705 in income for the local community. A recent analysis of Oregon’s coastal recreation conducted by the Surfrider Foundation found that the state enjoys significant economic benefits from nonconsumptive ocean recreation activities—those in which participants do not physically remove anything from the ocean—such as surfing, swimming, beach going, wildlife viewing, and boating. A random sample of 4,000 residents found that 80 percent had visited the Oregon Coast at least once in the past six months. In 2010, of an estimated 27 million trips made to the coast, 88 percent had the primary purpose of recreation, and the average person spent $87.74 per trip, an estimated $2.4 billion in total direct expenditures. As the Oregon study points out, the difficulty in quantifying the value of these coastal activities comes from the fact that they generate both economic impact and economic value. Economic impact reflects the movement of money through the economy—supporting local coastal communities and businesses and creating jobs. Economic value includes the value of an activity to the consumer above and beyond expenditures, including how much a coastal visitor would pay to access these resources. All recreation activities generate consumer surplus values that are generally not calculated in these analyses. For example, beach walking produces value for the consumer beyond what they paid for transportation or sunscreen. But this value is often difficult to quantify since the public does not typically have to pay for the value they receive. Going to the beach is free. For this reason, shore-based recreation is often undervalued in coastal management decisions. Additionally, the preponderance of research involving the nonmarket values of coastal recreation activities remains focused on beach going and recreational fishing, while other niche user groups like surfers, kayakers, and birdwatchers often contribute substantially to local economies with relatively little environmental impact. Surfing has also evolved into a multibillion-dollar industry, but little is known about the economic contribution of surfer visits to certain areas. Another study by the Surfrider Foundation and the University of California found that 300,000 people visit San Clemente, Calif., annually to surf at a single spot—Trestles. In the process, these surfers spend between $8 milllion and $13 million. The direct economic value of Mavericks and Trestles is significant, but the environmental, social, and cultural value of the places also carry great weight that is more difficult to quantify. Under the auspices of CAP’s Blue Economy project, we plan to help define both the economic impact and value of ocean, coastal, and Great Lakes tourism and recreation. Despite their natural resiliency, our wetlands are increasingly threatened by multiple stressors including erosion, climate-change-accelerated sea-level rise, and an increasing influx of pollutants such as fertilizers, chemicals, and crude oil from spills and leaks. In Louisiana alone, for example, a wetland the size of a football field disappears into the ocean every hour. The resulting habitat loss is not only damaging to the surrounding ecosystem, but to the economy, as well. The degradation costs the Gulf Coast dearly and is projected to worsen in coming years. The damage from extreme storms already costs the region an average of $14 billion annually. Further land development and subsidence, along with sea-level rise, are projected to accelerate such losses to the point that cumulative economic damage could reach $350 billion by 2030.29 The BP oil spill further shocked the Gulf Coast’s already compromised ecosystem. Coastal wetlands loss is not confined to the Gulf Coast, though. According to Restore America’s Estuaries, 95 percent of the original wetlands in San Francisco Bay have been destroyed, along with more than 40 percent of the tidal wetlands in Long Island Sound, and 73 percent of the original salt marshes in Puget Sound. Restoring these critical habitats is not only an environmental imperative but a great economic opportunity. The design, construction, operation, and monitoring of large-scale coastal and marine restoration projects bear the potential for sustaining job creation and increasing ecosystem services vital to supporting existing coastal livelihoods. In fact, the CAP-Oxfam report, “Beyond Recovery,” found that every $1 million invested in wetland restoration can create 29 new jobs, which is nearly six times as many as the oil and gas industries.31 And these jobs span a range of skills and occupations: dredge operators to civil engineers, biologists, landscape architects, nursery workers, boat captains and builders, and monitors. Furthermore, these jobs directly benefit local communities, and most cannot be outsourced. An analysis of Oregon’s forest and watershed restoration projects conducted by the University of Oregon found that the vast majority of restoration dollars stayed within the state. In fact more than 90 percent of contracts by restoration project managers occurred with Oregon-based businesses. A Great Lakes restoration project currently underway in Michigan is projected to produce huge economic returns for the region. According to a recent study by Grand Valley State University economics professor Paul Isely, a $10 million shoreline restoration project on Muskegon Lake will generate more than $66 million in economic benefits resulting in more than a 6-to-1 return on investment over a 10-year period. The report predicts that the project will yield a $12 million increase in property values, up to $600,000 in new tax revenue annually, more than $1 million in new recreational spending annually in Muskegon, and nearly 65,000 additional visitors per year. Likewise, a 2010 study found that a significant investment in Florida Everglades’ restoration would generate an increase in economic welfare of approximately $46.5 billion—a 400 percent rate of return on the initial investment—as well as create more than 442,000 jobs.4 And a 2011 survey found that 65 percent of Floridians consider protecting and restoring the Everglades to be “very” or “extremely” important, with 84 percent of these voters ranking the freshwater drinking resource to one in three Floridians “very important.” In addition to their ecological value, the Everglades are also a powerful potential economic engine for the state. Embracing the restoration economy has the potential to shift current economic activities and create entirely new ones, but obtaining the necessary data and quantifying the long-term economic value of coastal restoration projects is no easy task. Because restoration projects are often managed and analyzed by multiple entities, including federal and local governments, environmental organizations, universities, and private contractors, obtaining comprehensive economic data is difficult. In addition, projects are often assessed for job creation and economic impact on an individual basis, rather than projecting the long-term value that will come from creating a new industry and exporting the equipment and expertise to other regions. Wetlands are the nurseries of our ocean’s living resources and the first line of defense against storms and flooding for our coastal communities. Restoring them should be prioritized alongside repairing bridges, roads, and other traditional infrastructure projects that provide jobs and economic value immediately, while making a down payment on future security and prosperity for decades to come. Under the auspices of CAP’s Blue Economy project, our work in this space will continue to expand and refine the recommendations laid out in “Beyond Recovery” by examining the potential economic and community development associated with creating a coastal restoration economy, particularly in the Gulf of Mexico. The concentration of the U.S. population in coastal states creates a massive demand for energy. According to a 2008 report from the Department of Energy, the 28 states bordering the ocean and Great Lakes use 78 percent of the nation’s electricity. Yet to date, with the exception of a handful of pilot-scale marine hydrokinetic installations (wave, current, and tidal power), the only source of energy generated offshore is drilling for oil and natural gas. As we have exhausted near-shore oil and gas wells, American oil producers have been forced to move further and further from land, into deeper, and riskier waters. And of course the consequences of these increasing risks were realized in stark detail from April to July 2010 during the calamitous BP Deepwater Horizon oil spill. Fortunately, an answer is emerging that can help address the skyrocketing demand for electricity in coastal regions. It is an answer that comes without milking our outer continental shelf for every last drop of crude oil and perpetuating our self-destructive cycle of emissions that swaddle our home planet in another blanket layer of greenhouse gasses. Denmark built the world’s first offshore wind farm near Copenhagen more than two decades ago. 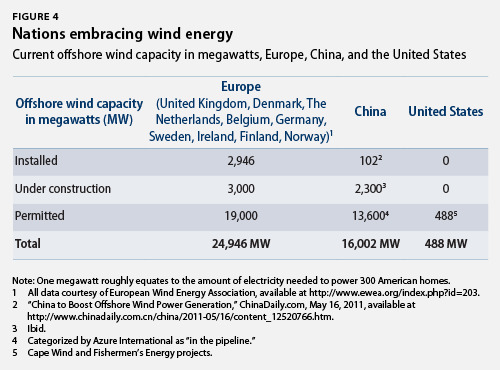 Since then offshore wind has been added to the energy portfolio of at least nine other countries in Europe and Asia. The East Coast of the United States, from the Mid-Atlantic region north through New England, possesses some of the world’s most favorable environmental conditions to tap into this massive renewable energy resource. But even though public opinion throughout the region strongly supports such development, we have yet to begin construction on even a single turbine. Not only does this delay reduction in greenhouse gas emissions and our transition to renewable energy sources, it also prevents American innovators from taking advantage of the design, manufacture, and construction of jobs that go along with it. In Europe more than 4,000 megawatts of offshore wind capacity is already installed, and developers expect to create 169,000 additional jobs by 2020 and 300,000 by 2030 as a result. Initially, the biggest hurdle to domestic offshore wind development was the lack of a federal permitting process. Today the Department of the Interior can issue permits, and the Bureau of Ocean Energy Management reviews permit applications as well as identifies wind energy areas it plans to offer leases for. Opponents of offshore wind farms, however, continue to publish slanted studies that skew perceptions of the effects construction of any single offshore wind farm will have on electricity ratepayers. These are often fueled by donations from pro-fossil-fuel organizations like the Koch brothers’ Americans for Prosperity. Such reports are often padded with apocalyptic predictions of massive job loss and skyrocketing energy costs, yet they fail to recognize that any first-in-class project will inevitably come at an increased cost. Future projects will benefit from one-time infrastructure improvements, lessons learned, and economies of scale that aren’t possible to have in place prior to construction of an initial project. Overcoming these obstacles will require an investment from the federal government. “Subsidies” has become a dirty word in Washington these days, though the oil and gas industry still enjoys $4 billion per year in subsidies from the federal government despite the industry’s record-breaking profits—an outlay staunchly defended by otherwise fiscally conservative members of Congress, including budget hawk Rep. Paul Ryan (R-WI). A similar investment in extending the production tax credit and making offshore wind energy eligible for the investment tax credit—already available to other renewable energy sources—would go a long way toward boosting the viability of this nascent industry. And as other sources of offshore renewable energy such as wave, tidal, and current power advance from pilot stages to potentially commercially scalable generation capacity, we must look at them as part of a true “all of the above” energy strategy as well. Of course, as more uses of ocean space gain momentum we will have to determine how to allocate what will swiftly become a crowded ocean environment. Such efforts will necessitate development of a streamlined comprehensive ocean planning strategy like the one called for in President Obama’s National Ocean Policy Implementation Plan. Under the auspices of CAP’s Blue Economy project, we will lay out the investment requirements and potential economic return for developing a cost-effective, environmentally responsible offshore wind industry in the United States. Our oceans are mystical entities. They can embody extreme peril or utter relaxation. Intimate familiarity or otherworldly discovery. Tranquility or chaos. As a species, we are magnetically drawn to them for sustenance and solace, and for centuries we have been fed by their bounty. They also drive our economy. Fortunately, these seemingly incongruous roles are not mutually exclusive. The United States can derive great financial benefit from these natural resources without compromising their beauty, health, or vitality. As we pursue our investigations into the four segments of the ocean, coastal, and Great Lakes economy detailed in this brief, we are confident our findings will help prove that the best way to create a robust coastal economy is to start with clean, healthy oceans. Michael Conathan is Director of Ocean Policy and Kiley Kroh is the Associate Director for Ocean Communications at the Center for American Progress. Erin Gustafson, Energy and Environmental Policy intern, contributed.